This entry was posted in Art, Birds, Creative Writing, Flowers, Nature, Poetry, Writing and tagged Breeze, Clouds, Earth, Emily Dickinson, Raindrop, Solstitium, Sparrow, Summer Solstice, Summer's Full, Ute Prayer. Bookmark the permalink. 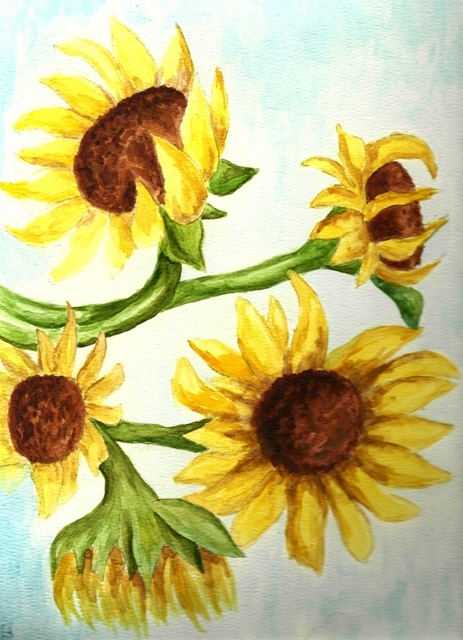 Your mom’s sunflower painting is exquisite, the essence of summer! And your poem, spending the summer solstice alone, “softly, quietly; under a few clouds,” sounds like a divine experience. Beautiful post, Diane! A profoundly beautiful post, my dearest. I thank you, your mother, the Utes and Emily all from the depths of my heart. I read this and am at peace!